The upcoming solar eclipse on Monday, August 21, has generated considerable interest around campus and beyond. Although we are not in the 70 miles wide path of the total eclipse, if it is not cloudy, we will still be able to see a partial eclipse. Lucky people, those who registered for it (registrations are closed), will be able to watch it courtesy of Villanova’s Astrophysics and Planetary Science Department. What exactly is a solar eclipse? During a total solar eclipse, the moon appears to completely cover the sun and the sun’s corona (its outer atmosphere) is visible. Outside the path of the total eclipse, observers will see a partial eclipse in which the sun is partially covered by the moon. Warning: Unless you are wearing approved eclipse glasses do not look at the sun during an eclipse (except during the short time it is completely covered) and do not photograph it (unless you have the appropriate filter on your camera). To watch the eclipse without the proper glasses, use a pinhole camera or solar eclipse viewer. These are easy to make and directions are available below. 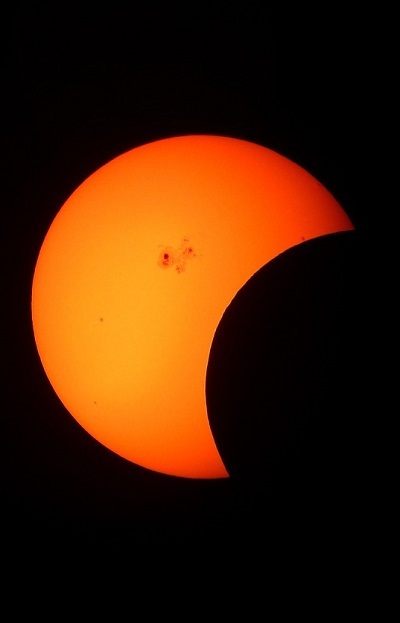 There are two to five solar eclipses per year; total solar eclipses are less frequent – one about every 18 months. So if you miss this one, there will be more. “How to Make a Solar Eclipse Viewer.” Live Science Staff.